Cooloolabin is a locality in the Sunshine Coast Region, Queensland, Australia. Most of Cooloolabin is mountainous, densely forested and within the Mapelton National Park, including Mount Bottle and Glass (230 metres) and Swain Peak (280 metres). Only two small valleys to the south are developed as rural residential areas. Cooloolabin is an Aboriginal word meaning "place of koalas". Cooloolabin Provisional School opened in 1915. It became Cooloolabin State School on 1 September 1916. It closed in 1962. ^ a b "Cooloolabin - locality in Sunshine Coast Region (entry 49230)". Queensland Place Names. Queensland Government. Retrieved 31 July 2017. 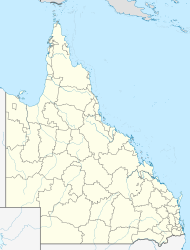 ^ "Queensland Globe". State of Queensland. Retrieved 31 July 2017.